Conference and Corporate Meetings at the Town Hall in Tiverton are a unique experience. Located in the heart of this Mid Devon Town, the Grade 2* listed Town Hall is the setting for local Council meetings and public gatherings. The New Hall is an event location in the centre of Tiverton with tiered seating, a stage and specialist sound and lighting facilities. 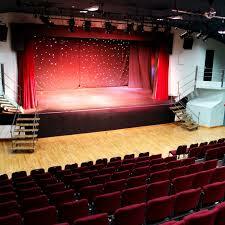 There are three different spaces which can cater for as few as 10 people to 220 people. Tiverton is well served by local and national bus routes and the main line railway link from London and the North of England, making it easy for your delegates and guests to reach, making the Town Hall or New Hall the perfect location. Perfect for team meetings and brainstorming! The Mayoralty room is filled with artwork and has an intimate feel. It is perfect for smaller team meetings for up to 30 people. The antique tables and chairs can be arranged according to your needs. Companies which use this room for team meetings have commented on the atmosphere and return time and time again to this unique setting. The room directly overlooks Fore Street and the hustle and bustle of Tiverton. Tea & Coffee/Projector Screens/Projector/Wireless bluetooth Speaker and Flip-charts can be provided for an additional charge. This room is where we currently hold all Town Council Meetings. There is a large projector screen which can be automatically raised or hidden away if not required. An added bonus is the in built microphone facility which enables delegates to be heard during question time at the press of a button. The number of tables mean that the room can be arranged to suit and that breakout areas or brainstorming tables can be arranged. There is a servery attached to the Chambers in which outside caterers can prepare buffet luncheons if required. Tea & Coffee/Projector Screens/Projector/Wireless Bluetooth Speaker and Flip-charts can be provided for an additional charge. The Council Chamber can be utilised for those wanting to host craft/wedding or toy fairs. The space is large enough to accommodate 20 exhibitors and there is a bonus of the servery right next door where refreshments can be made. The New Hall is perfect for corporate celebrations, it is used by operatic societies and drama groups for elaborate stage productions. If you wanted a place where your employees could really celebrate success, then look no further than the New Hall. The New Hall has many smaller rooms (Such as dressing rooms) which can be utilised for breakout sessions. There are full industrial kitchen facilities although food and refreshments at the New Hall must be provided by your own caterers. If your celebrations move into the evening the New Hall is able to be used as a function event with a separate bar area which faces onto the main reception area. Perfect for mingling before the main event. 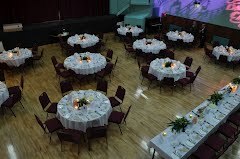 The main hall can then be converted into a wonderful function area, idea for dances and discos for 300 or cabaret and dining for 150. The Small hall is available as a self contained unit, having its own entrance, toilets and changing room facilities. It is perfect for small groups, teams, clubs or gatherings. All of the venues have full disabled access.